I've been playing World of Tanks on my PC for a number of years. I've seen the game change many times since I started playing. From the addition of larger and more powerful tanks, to the physics engine and graphical overhaul of 8.0 and beyond. The changes I've noticed in Wargamings first console port are by far, the most drastic. From the mechanics of upgrading and purchasing new tanks, to the way the games flow, everything has been noticeably adjusted or overhauled. The game feels significantly different from top to bottom. At first blush, I was a little disappointed to see the World of Tanks I knew so altered. The more I play, however, the more convinced that most of these changes are good. What Wargaming has built isn't just a port of their existing game to a popular console. They went back to the drawing board to build an experience tailored to the console. The PC version focuses more on long careers and making small tweaks to your tanks loadout to suit your playstyle. It's a deep game, and best played over a long period of time. The 360 version has been tuned to make more appealing to "pick up and play." The customization is a little less detailed, allowing players to purchase upgrade sets that work as premade loadouts. You cant swap out individual parts like you can on PC, but each of the "kits" are suited to particular roles on the battlefield. The combat itself is played at a much faster pace on the 360. Again, this is meant to speed players along, allowing them to accomplish more in a shorter amount of time. Rounds reload faster, tanks travel faster, damage tables have been bumped up a little and experience accumulates faster. Going from the PC to the 360, these changes really threw me off for a while. My earlier matches, I was so unaccustomed to the speed of play that I mis-timed many of my shots, and found myself killed by shots I would have normally glanced off, or done far less damage. But after spending more time on the 360 Edition, I learned from my early mistakes and am pleased to report that my performance has dramatically improved. The console version does have a learning curve. One that I think is more drastic for long time players like myself. Newcomers to game will likely find it more accessible than the PC version. 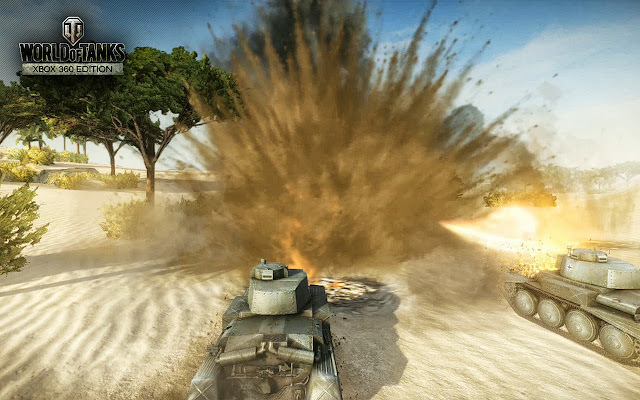 The 360 Edition is built more to bring World of Tanks to a whole different group of gamers. It's expected that those already playing on PC will stay with the PC version. While I mourn the loss of customization for my tanks, the 360 Edition does allow me to get into the action a lot faster than the PC. While it took me time to adjust to the new speed of the game, I soon found the rhythm. This isn't the same game I've played for years, but it's no less entertaining.